The Atal Pension Yojana (APY) Scheme got the approval from the Government of India. 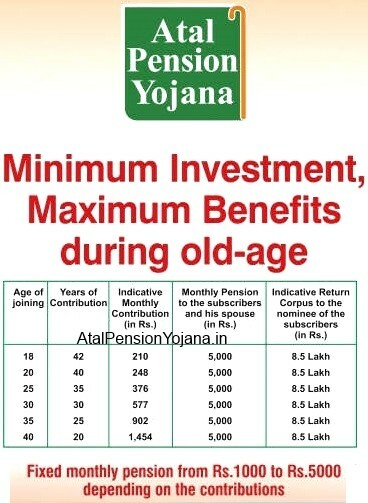 Atal Pension Yojana (APY) fixed pension for the subscribers ranging between Rs. 1000 to Rs. 5000, if he joins and contributes between the age of 18 years and 40 years. The contribution levels would vary and would be low if subscriber joins early and increase if he joins late. Atal Pension Yojana (APY) is open to all bank account holders. The Central Government would also co-contribute 50% of the total contribution or Rs. 1000 per annum, whichever is lower, to each eligible subscriber account, for a period of 5 years, i.e., from Financial Year 2015-16 to 2019-20, who join the NPS between the period 1 st June, 2015 and 31st December, 2015 and who are not members of any statutory social security scheme and who are not income tax payers. However, the scheme will continue after this date but Government Co-contribution will not be available. The Government co-contribution is payable to eligible PRANs by PFRDA after receiving the confirmation from Central Record Keeping Agency at such periodicity as may be decided by PFRDA. Age of joining and contribution period: The minimum age of joining APY is 18 years and maximum age is 40 years. The age of exit and start of pension would be 60 years. Therefore, the minimum period of contribution by the subscriber under APY would be 20 years or more. APY is eligible for income tax ? im not income tax payer still now. Can you clarify my doubts. I AM HAVING A QUERY THAT WOULD LIKE TO SHARE AND WANT TO BE RESOLVED . I SUBCRIBED FOR THE ATAL PENSION YOJANA BUT TILL NOW I AM NOT HAVING THE ACCOUNT NO TO WHICH MY CONTRIBUTION IS BEING CREDITED,NOR I AM HAVING ANY DETAILS ANY LETTER REGARDING THIS. PLEASE HELP ME OUT ON THIS???? FURTHER I WOULD LIKE TO HAVE AN ONLINE EXCESS REGARDING THE SAME …WHAT IS THE PROCEDURE TO VIEW MY STATEMENT FOR ATAL PENSION YOJANA ? this scheme is eligibleornot eligble. I have applied APY thru bank. However we have not received any permanent documents. Also can I change the premium amount after 1 premium deposit. Please clarify. How can I get any proof copy of spy. Me & my wife applied for APY through HDFC Bank as we are having our joint account. It has been observed that every month Rs 1318 * 2 are getting debited from my bank account through ecs for APY . As per APY circular no where for Rs 5000 pension the above mentioned amount is reflecting & moreover as per both of us age group the monthly subscription amount should be Rs 1452. In this connection I also connected with my banker but they are also not in a position to reply on my query. As per my so far experience the initiative taken by the government towards social security is really great but they should have proper infrastructure & support system in place to make it more popular. This pension scheme can show the tax deduction in the financial year 2015-16 ? Contact your bank for the acknowledgement. You should be given acknowledgement letter of apy. Contact your bank. Contact your bank for that. income and is not filing any Income tax return is either eligible under this or not. income and he / she is filing Income tax return is either eligible under this or not. the taxable limit, or viceversa whether he / she is eligible or not under the APY. Kindly clarify the above for which I will be thankful to you. As all of us are aware that APY has been introduce to provide social security . In this connection I like to say that the upper limit of pension amount is Rs 5000/- only, but the way price of any essential commodity / treatment cost every thing is going up do you feel that after 20-30 yrs actually it will help us in terms of providing financial support. Here my submission is if Govt increase the upper cap to at least Rs 2500/- then actually the objective of the scheme may be fulfill. It a request if Govt can think over it to increase the upper cap to at least Rs 25K per month it will help all of us a lot & actually provide some stability in terms of financial support in the retirement age . Sir My name is shashi prakash and i enroll in atal pension yojna but i am not receive any document from your side, and every month from my saving account debit primium. i have my pran no. pls help me.